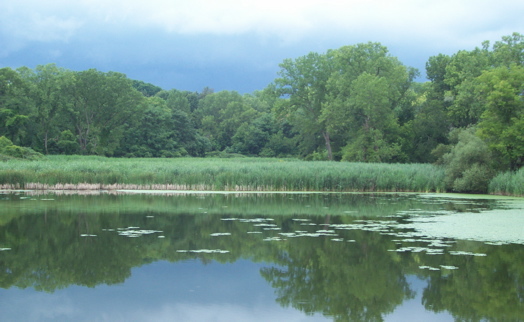 The city bought the Tivoli Lake Preserve in the Arbor Hill/West Hill neighborhoods back in 1851. Its man made lake was built to be part of Albany's water supply system. Eventually the land became more of a dumping ground, but in the 1980s community groups and environmentalists cleaned up the area and had it turned into a nature preserve. These days it's cared for by the folks at the W. Haywood Burns Environmental Justice Center. Tivoli is kind of an urban oasis with all kinds of recreational opportunities. Trails meander through the densely wooded area and circle the lake, offering gorgeous mountain views. It's overgrown and a bit unkempt, but it's still a beautiful place for a nature walk. It's a bucolic jaunt that makes you completely forget about the noise of the city outside, despite its close proximity to Interstate 90. Canadian geese, songbirds, and fish abound, and some people have even reported seeing beavers. The preserve is actually pretty easy to find. The entrance is near Livingston Middle School on Northern Blvd. Here's a heads-up though -- some of the trail markings are a bit crowded by low leaning plants, so you probably don't want to traverse the trails by yourself unless your natural sense of direction is far better than ours. A map out front shows the trails, but when we were there this past weekend, there were no maps left in the box. Bring a compass ... or some bread crumbs. Yeah, bring a compass. And a gun. Bill seems to address the question in my mind...is it a safe park? Something about all that unkempt overgrowth gives me pause. I also share the same concerns about safety. I went in the middle of the day and brought my dog. I didn't feel nervous, although he is a 180-pound English mastiff. I just made sure not to leave valuables in my car. I actually just arrived back from Tivoli a few minutes ago. I've recenly moved to Albany and was checking it out wondering how to get a "friends group" going. I did some research to find that there actually is an unofficial group. It talking with a police officer in the parking lot, he told me that most people are afraid to use the park and leave their cars in the parking lot. I must say, I did bring a knife with me. I didn't bring my wallet but did put my business card in my pocket for ID. I've never actually had any problems there though but can see the possibilities. We just had a community cleanup event in Tivoli Preserve this weekend - 4/16/2011 and we collected lots of trash. We will be doing trail maintenance later this summer. I have been going in the preserve for 8 years and have never had any problems with anyone there, the people I see most using the preserve are sustenance fishing populations and students from the surrounding schools. As far as the grass being uncut, what do you expect to see in the woods? Go to the Catskills or the Adirondacks and check to see how much of those areas are mowed. I lived a couple of blocks from the middle school and used that park all the time to walk my dogs, especially in the summer after work and on week-ends. My dogs loved it (including a quick dip in the water to cool off). I never saw any illegal activity, suspicious individuals or "dangerous" people. Most people were also there to walk their dogs. Can something happen there? Sure, just like it can happen anywhere else you go. I second Douglas' statement. Treat people with respect and you will get respect back. Not unlike any other place in the world. @Bill: bad idea. Not at all necessary. Brought my Girl Scouts there for a walk today. Great place and should be utilized more. Would love to see guided nature walks or other events to get people to visit and appreciate this wild space right in the middle of the city. Is the park still open? I am in the newly built 55+ apartment complex bordering the preserve and would love the opportunity to take a morning walk in the rural like setting. @ Pete: as far as I know, it's always open, since you can access the park from multiple points. I used to get to it through the parking lot of the former Livingston Middle School, where you can leave your car, and cutting across the back field of the school. I also wouldn't really call it a "park". It's more like a nature preserve, since it is not regularly maintained and it has little to offer other than the pond and the trails. It's very nice, though, if you want to walk your dog in a large area that is not the city's sidewalks. Dogs love it! It may not be for everyone but if you like to hike in a more challenging/natural environment Tivoli park is a bit of heaven in the middle of the city. The park is safe, the surrounding neighborhoods are not as safe, but as for going to the park noone is going to bother you they are too worried about harming themselves....a whole different animal entirely.. I lived in and out of Albany my whole life ...even stayed directly across the street from Trivoli Park and know the full park very well..As a child we rode dirtbikes and other ATVs from Colonie St. to Colonies NY, fished and caught other aquatic lifeforms, walked our dogs, went rafting, nature walks etc...Efforts are being put forth to make access easy trails and a better educational experience...I attended an event yesterday and I will be volunteering to bring the park to respectable standards and more tourist friendly.